Northern Health Chiropractic in Ishpeming, Michigan is more than just a chiropractic office. We offer many different services beyond chiropractic care to help improve your quality of life! Check out the services we offer below, we’re sure you’ll be contacting us before you reach the bottom! Of course, being a chiropractic office, we offer chiropractic care to keep your body in peak wellness. Chiropractic improves more than just spine/back problems, in fact there are many other ways it can benefit you. Chiropractic has been shown to reduce overall medical costs by improving headaches, blood pressure, asthma, organ function. Chiropractic has also been shown to prevent the need for surgery in some cases and also ease pain associated with pregnancy and the birthing process. Chiropractic care is often poorly misunderstood, and many people have no experience with Chiropractors. It is founded upon the premise that when spinal bones are functioning in normal motion and position, the central nervous system can deliver its vital energy for the proper function of the body’s tissues, organs and systems. With this philosophy, Chiropractic is not simply treatment for pain! Like Dentistry and regular check ups, Chiropractic involves regular check ups to identify subluxations in the spine, comparative to cavities in the mouth. Everyday occurrences can cause the spinal bones to lose their usual motion or position. This can set off a chain reaction affecting the vertebrae, nerves, muscles, soft tissues and results in degenerative changes throughout the body. Chiropractors are the only doctors trained to detect and correct subluxations through safe, gentle, and specific adjustments. Northern Health Chiropractic offers chiropractic treatment for patients from birth to adult. Many times infants spines get out of alignment in the birthing process, this can lead not only to spinal problems, but also the nervous system which affects many parts of the body. Ever wonder why your infant won’t stop crying? Give chiropractic a try. Chiropractic has also been shown to promote a healthy pregnancy. As the baby grows, pregnancy can introduce much more strain to your back and joints than your body is typically used to. A properly aligned spine and pelvis can greatly ease your pregnancy all the way through the birthing process and prevent the need for a c-section or other doctor intervention. Young children can also benefit from chiropractic care! The earlier spinal misalignments are treated, the better chance of complete healing and spinal correction. This can lead to a long life of health without pain. But no matter your age, it’s never to late to get started with chiropractic. Contact our office today to setup an appointment to get on the track to better health! Had a stressful day or busy month? Massage is a great way to relax and calm your whole body. If you haven’t tried it, just give it a try, you’ll be happy you did. Massage therapy is also the perfect compliment to chiropractic care. Schedule a massage before or after your chiropractic visit to maximize the effectiveness of your adjustment. You can also schedule regular massages to help calm and soothe the muscles in your body for maximum relaxation and pain relief. Massage can also help with joint pain, sports injuries, soft tissue strains, fibromyalgia, and can even help reduce stress, headaches, and anxiety! Northern Health Chiropractic is proud to offer therapy massage roller tables to compliment your chiropractic care. Use of these tables before your adjustment helps soothe the muscles near the spine to help make tough adjustments easier. Use of these tables after your adjustment helps calm the muscles and retain your adjustment. As needed we also have posture improvement devices used in conjunction with the therapy table to improve neck posture, back posture, and spinal compression. If you’ve been in an accident or have a bad injury our doctors have knowledge in therapies and exercises you can do at home to complement your care! We’ll work with you to create a exercise/therapy program that fits your schedule and abilities to get you on the mend quicker. Northern Health Chiropractic can make you orthotics customized to your feet. If we find, though your chiropractic care that the use of orthotics would help relieve your pain, we have special foot scanning equipment to customize an orthotic to your foot. The scanner scans and senses pressure points and arch problems among many other things. With this information we can produce a shoe insert individually customized to each of your feet. Foot Levelers custom orthotics combined with chiropractic care will have you on the quick path to relief! Northern Health Chiropractic is your one stop location for complete wellness. 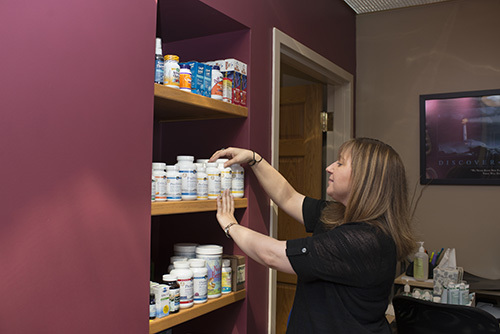 In addition to all the services we offer, we also sell supplements, vitamins, therapy creams, and many other healthy, healing products. We also sell posture devices including posture pillows, lumbar devices, neck posture correction devices and more. Come on in to see all we have to offer!